Democratic New York Rep. Alexandria Ocasio-Cortez stated on Monday that the United States should pay reparations to the non-white communities who were negatively impacted by America’s New Deal. If AOC was a conservative. She will probably win in her district but is really a gift to the Republican party. She is just so stupid. Apparently, she is not as stupid as are the voters in her district, you think? We have our own supply of stupid voters, ever hear of Sheila Jackson Lee? I acknowledge my privilege of being born cisgendered. More simply put: Normal, regular or common. AOC comment on Howard Schultz wrong. 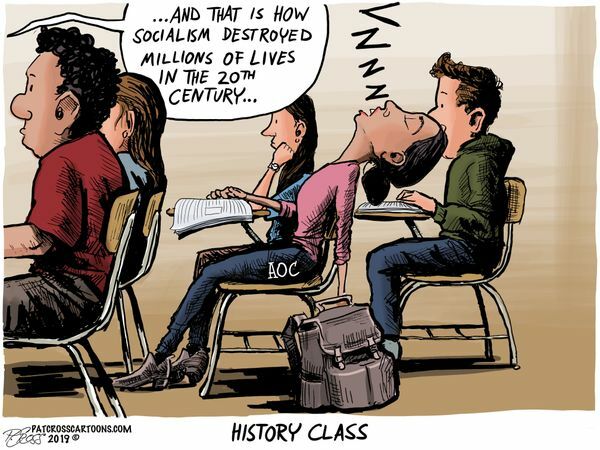 AOC critized Trump for not doing his homework for SOTUS. She wore a pin with the a photo of a foreign born child who died in the US from dehydration or illness. Sat down and stopped clapping when Trump criticized murdering US born babies. Green New Deal requires “massive government intervention”. She’s ready! One wonders if she keeps this up for two years will she single handiedly kill the Dems chances in 2020. Oh BTW Boeing unveiled plans for a supersonic private jet so the green celebrities can travel faster to their environmental gettogethers. Wipes away tears at funding for Border patrol. Democrats launch Green New Deal. AOC convinced 4 presential candidates some Senators and a bunch of representative to sign on. The world has gone mad. Currently solar and wind produce less than 1% of our nations energy. Both are unreliable, since they produce nothing for big parts of the day. Had the North been relying on that power during the recent Polar Vortex. They all would have died. Oh and the switch will occur in ten years. Elizabeth Warren and Cory Booker both signed on. Lol, she’s the lead lemming. So what's the down side for the red states?